Essence of Time mission in Donetsk turns 3 years! 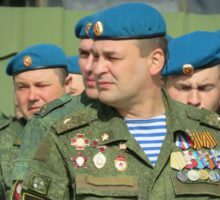 The previous stage – carrying out tasks in Yasinovataya and Panteleimonovka – became decisive for me in choosing my specialization. To be more precise, Essence of Time Independent Tactical Group (EoT ITG) Volga chose my specialization by handing me a sniper rifle, but I gladly jumped at the chance. You bet I did, given that in my past, pre-war life one of my hobbies was rifle shooting, though an air rifle, but nevertheless it was it, the shooting, which allowed to enter my valued state of specific tranquility and concentration. I have no idea how the commander guessed this, but I am very grateful to him for choosing me. Some time later the commander got another rifle, and my friend and comrade Liteyshik and I became the first sniper pair of our unit. Later in the airport five snipers were in EoT ITG. 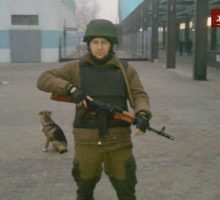 Kot and Volga, Essence of Time unit in Donbass. 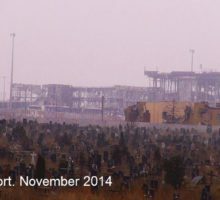 November 2014 was an anxious month for the Information Center. 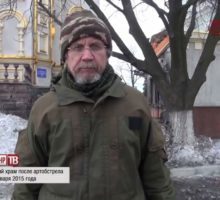 Despite the fact that main work on producing video reports, gathering and publishing Vostok brigade’s press-center situation reports was already customary, Vostok brigade’s combat leaflets were published regularly, our guys entering their positions in the airport was a difficult moment. Everyday we were receiving situation reports on the wounded, were worried about our comrades. The three of us arrived to Donetsk. It turned out to be very easy: you cross the border and customs — and that’s it, war. We crossed the border and were met by a militiaman on a car. One may say that this was our first acquaintance in the militia. We knew the call sign of the person who was supposed to meet us. We approached the car, introduced ourselves, got in, and started moving. En-route we learned from the driver where an Orthodox church is, and stopped there for a moment (our driver turned out to be Ishym — a calm man with a black beard and glasses; he met us from home and he saw us off home. A good man, I got to know him better on Vostok base during my injury). starts with the story of the unit’s commander – Volga. The stage covers November-December 2014. In early November 2014 we managed to go to Moscow as a small group. We gave speeches on Essence of Time rally dedicated to November 7. 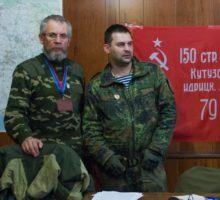 We returned to Donbass on November 11. 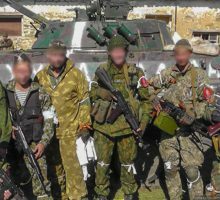 Essence of Time combat unit in Donbass members with a captured Ukrainian IFV. 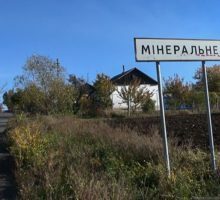 I arrived to Essence of Time Mission in Donbass in late September 2014. Before that I served in the Donetsk People’s Republic prosecutor’s office units. A significant and important difference of Essence of Time unit for me as compared to my previous experience was the way comrades treated their duties. In the overwhelming majority of cases people approached the tasks they were assigned with enthusiasm, readily responded to requests for help. Of course everybody was different, with their own special traits, inclinations and difficulties, but the general impression was as follows: here people call each other comrades not because the manual says so, but because that is the essence. About a week after we moved to Vostok brigade base we got ill. We lived in car repair bay at the time. Almost all of the personnel of our unit had cold-related diseases. Endless kitchen duties were an addition to this, which seemed ridiculous in the wake of ongoing combats. But we did the work we were assigned without complaining. 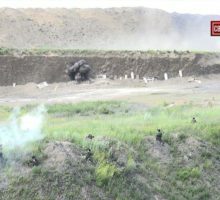 The guys from the brigade treated us as a training company. Who would have thought that by the age of Christ I will suddenly find myself in the army. More so, fighting in the war that has the characteristics of both the Great Patriotic War, and the Russian Civil War, and sometimes of the wedding in Malinovka. At the same time, I’m no military person, but I’ve read literature about military. 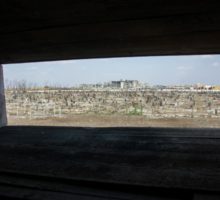 What do I want to note as a result of a year of the war in Donbass (from July 17, 2014, to July 23, 2015, when this article is being written)? While on Vostok base we lived in the car repair bay (the “barracks” of the training company). The conditions there were such that many of us were ill and couldn’t do their duty. As a result we started to think, “How can we move to a place with no dampness, fungi, dust?” I remember Mars joking, “When we bring so many recruits to the battalion that there won’t any place to house them, then the base (residential quarters) will become bigger.” Two weeks later we moved to new barracks.